In the early '60s, it was the biggest Honda available, propelling the rider into a full-blown adrenaline rush with unsurpassed power and speed. 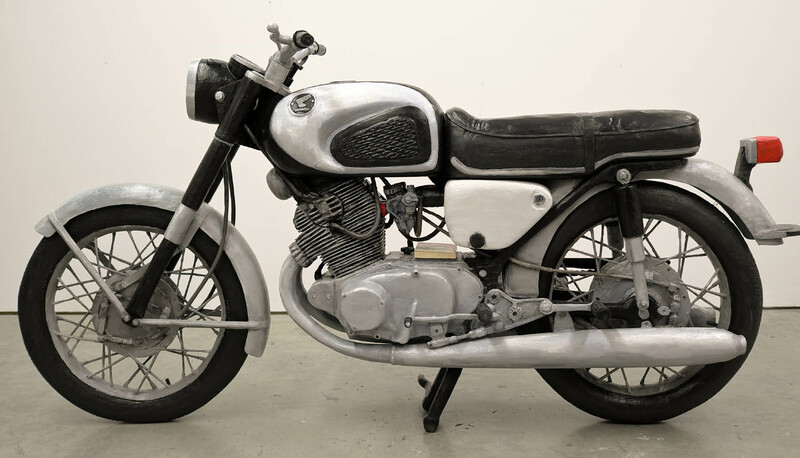 The 1961 CB77 Super Hawk was the beginning of something spectacular-the Honda sport bike. With speeds approaching the 100-mph mark, this was not a machine for the weak of heart. But the addition of telescopic forks, dual carbs and twin leading shoe brakes greatly enhanced acceleration, braking and handling. The CB77 gave the rider a feeling of control that many bikes of that era could not duplicate at half of the Super Hawk's top speed. The 305cc engine came complete with overhead cams, a luxury that was found exclusively in the racing community at the time. Its 9200-rpm-redline was a nice antidote to the low-revving and quiet machines being developed in Europe. The 350-lb. stamped steel and tube frame provided a landing point for one of the decade's finest engines. Indeed, the CB77 was a loud and race-ready contender. 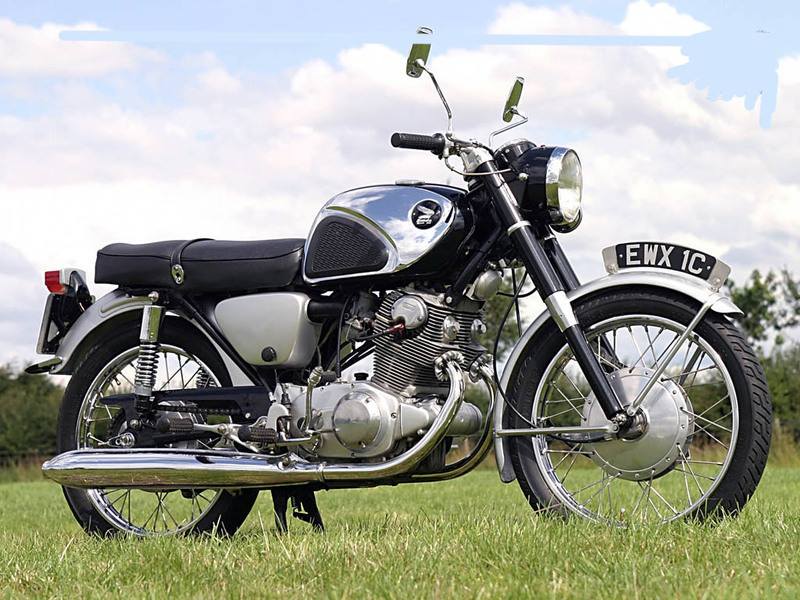 The Super Hawk owned the top spot in the Honda lineup until 1965 when Honda released the CB450. CB77 is a trademark of Honda Motor Co., Ltd. &0169;1999 American Honda Motor Co., Inc.
Nine thousand revolutions per minute in top gear gives a road speed in the region of 94 mph on the Honda CB77 and, with the needle flickering towards the 9,400 rpm mark coming down the Mountain towards Creg-ny-Baa, I was travelling at just over 100 mph. As always on "open road" days during T.T. week, small groups of spectators gather on some of the trickier bends to watch the production roadsters imitating the T.T. aces and as I braked heavily, changed down and dropped to a respectably sedate pace round the tight right-hand bend, I could almost hear a couple of lads wondering: "Is it the 250 or 305 Honda?" In fact, during the weeks I had the machine on test, time and time again I was asked the difference between the two sports Hondas which, apart from the tank badge, are externally identical, and internally differ by a mere 55cc. What is the point of building two machines so much alike that they vary only in cylinder bore dimen­sion and, slightly, in the ratios provided by the four-speed gearbox? Where does the extra 55 cc count on the CB77? To answer these questions one has only to compare the specifications of the two Hondas. The 250 produces 24 bhp at 9,000 rpm, whereas with its extra 55 cc, the CB77 pokes out another 4 bhp, which in terms of per­formance means some 5 mph additional top speed. It is also interesting to note that the power band is wider on the 305, with maximum torque of 18 lb-ft at 7,000 rpm, compared with 15 lb-ft at 7,500 rpm from the 250. This means that the CB77 is more flexible than its 250 cc counterpart and, with more urge lower down, acceleration is also slightly better than with the CB72. However, with both machines having twin carburetors, twin coil ignition, twin leading shoe brakes front and rear, twin contact breakers, twin speedometer /tachometer head, a chain driven overhead camshaft, and 180° opposed cranks for each of the two connecting rods, in all other respects they are identical. Even the lavish standard "extras" such as handlebar mirrors, electric starter, steering lock, pillion footrests, neutral indicator light, and a toolkit which in­cludes spare sparking plugs, are included on both models. Having pointed out the variations between these gener­ally similar sports Hondas, I can now confine myself to the CB77 which I have had the pleasure of riding. Performance has already been briefly mentioned and I would add that for the capacity of the machine, it was 'outstanding. A motorway cruising speed of 80 mph was maintained on the journey from Liverpool to London and the time of 4 hours taken on the run, including stops for refueling and meals, is good even for a motor cycle of twice the capacity. Fuel consumption of 64 mpg was reasonable, considering the high-speed maintained and during 40-50 mph runs, this figure improved to 80 mpg or better. Acceleration from a standing start was the equivalent of most 500s and if one revved the engine to maximum in each gear before changing up, it was necessary to cling to the handlebars tightly to stop one sliding backWards along the dual seat. Apart from the fact that one had to keep the revs above 6,000 to get the best from the motor, it was diffi­cult to fault the mechanics in any way whatsoever. The motor remained oil tight throughout the test. The gear ratios seemed ideally spaced for about-town or open road use, although top gear proved a little high for power output when riding into a strong headwind and maxi­mum 9,000 rpm in top gear could only be obtained in prone position on a long straight. Speeds in the gears were approximately 40-45 mph in first, 55-60 mph in second, 75-80 mph in third and 90-95 mph in top. With a 90 mph machine, one needs brakes which are more than just adequate. Honda appreciates this point, and only in the wet did care have to be taken, to avoid making the rear wheel slide by applying the rear brake a little too firmly. The same also applied to excessive use of the throttle in first or second gear under such conditions. Road-holding is one of the most important features of any sports machine and although the CB77 may not be 100% positive in its actions when swinging .through fast, twisting and slightly bumpy bends, it can be classified as good. My reason for hesitating to classify the handling as excellent is that there were occasions when the front wheel twitched somewhat when accelerating out of a bend —a tendency which I found could be counteracted by winding the throttle open. I put my yearly average at about 30,000 miles, approximately half in a car and the remainder on two wheels. As a long-distance rider, I put comfort on a motorcycle as of prime importance. Sports machines with clip-ons or straight bars leave me cold as I normally find them most uncomfortable. However, the Honda is an exception to the rule, for the positioning of the footrests, seat and straight bars are such that one is leaning slightly into the wind and resting very lightly on one's hands at speed—an ideally comfort­able position, in fact. There is plenty of room on the dual-seat for the pillion passenger and with adjustable pillion footrests, passengers of any shape or height can be accom­modated. The rear suspension units are also adjustable, so that suspension characteristics can be modified when carry­ing additional weight. Electrics on the big Honda's are all 12-volt to cope with the demand from the electric starter. This means that once it gets the benefit of a lighting system which is fully adequate for such a high-performance machine. The dip-switch, situated on the left handlebar, not only incor­porates dip and main beam positions, but also has a third, central, position for switching to pilot light when riding through town. This saves having to remove one's hands from the handlebars to reach forward to operate the switch on the headlamp shell. Horns on most motorcycles, large,or small, are pitiful. Honda fit a wind-tone unit which is efficient and effective at speeds up to 60 mph, although even this still lacks the power for really high-speed "I am overtaking" warnings. As already mentioned, Honda have an electric starter fitted to the CB77 and no matter what the weather, cold, warm, wet or dry, starting was no problem once one learned the knack. With ignition and fuel on, the throttle was partially opened and, with the starter button being pressed by the right thumb, the choke lever was closed until the engine fired and then partially opened to allow the motor to build up revs. If the engine began to die, the choke lever was quickly closed again to richen the mixture and then par­tially re-opened again. By juggling with the choke con­trol and not touching the slightly open throttle, it was possible to obtain instant starting on the coldest, dam-pest mornings. When warm, the motor required only a frac­tion of a second's touch on the starter to set it in motion. In addition to the electric starter, there is a kick start fitted and this operates in the unusual kick-forward man­ner. This means that should a fairing be fitted to the bike, the kick-start might prove almost impossible to use. The excellent finish of this model calls for as much praise as its superb range of extras. Silencing of its super-smooth twin engine is first-class and only minor criticisms could possibly be levelled against the 305 cc Honda CB77, a machine which is another example of Japanese engineering that gives excellent value for money, at its price of £279 including tax.